1 male age 20-30 (Seth). 1 female age 20-30 (Sarah). 1 male under age 5 (Asael). Seth Henshaw, age 31, born in North Carolina; farmer; $2500 real estate. Sarah Henshaw, age 30, born in Ohio. Acsa Henshaw, age 10, born in Indiana; attended school. Tarissa Henshaw, age 9, born in Indiana; attended school. Martha Henshaw, age 7, born in Indiana; attended school. William Henshaw, age 5, born in Indiana; attended school. Seth Henshaw, age 42, born in North Carolina; farmer; $5000 real estate; $900 personal property. Sarah Henshaw, age 41, born in Ohio. Martha Henshaw, age 17, born in Indiana; attended school. William Henshaw, age 15, born in Indiana; attended school. Augusta Bryer, age 14, born in Indiana; attended school. Hinshaw, Seth, age 52, born in North Carolina; $12,400 real estate; $11,738 personal property. Hinshaw, Sarah, age 51, born in Ohio; keeping house. Hinshaw, Eunice, age 16, born in Indiana; house keeping. Hosier, Martha, age 26, born in Indiana; $150 personal property. Hosier, Alice, age 5, born in Indiana. Hinshaw, Seth, age 62, born in North Carolina; parents born in North Carolina; farmer. Hinshaw, Sarah, wife, age 61, born in Ohio; parents born in Virginia; "cripple"; "maimed, crippled, bedridden, or otherwise disabled". Walton, Eveline, servant, age 28, born in North Carolina; parents born in North Carolina; keeps house. Hinshaw, Seth, head-of-household, age 82, born Apr 1818 in North Carolina; parents born in North Carolina; married 16 years; owned house free of mortgage; occupation: "capitalist". 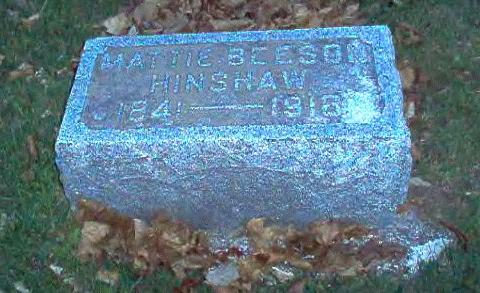 Hinshaw, Mattie, wife, age 58, born Jul 1841 in Indiana; parents born in North Carolina; married 16 years; no children. Seth Hinshaw, one of the early settlers, and for more than forty years a resident of Greensboro, was one of the first Abolitionists in the county, and was intimately connected with the management of the Underground Railroad. He was reared a Quaker, but withdrew from the society in the latter part of his life. He was eccentric, but a good citizen, hospitable and liberal. He was a merchant, but would sell nothing produced by slave labor. Ireland has doubtless contributed more to the population of the new world than any other foreign country and, wherever found, these sturdy emigrants from the Emerald Isle, as also their sons and daughters, are noted for their thrift and enterprise. The grandfather of the subject of this sketch was a native of Ireland and he and his wife, who was a native of Wales, immigrated to this country, their marriage occurring after their arrival here. They settled in North Carolina and there the father of the subject was born. He was reared under the parental roof and was married in his native state to Miss Annice Bowman, whose family were from Wa1es. Benjamin Hinshaw and wife reared a family of twelve children, nine sons and three daughters. All of their children lived to advanced years, the youngest being sixty-six years old at the time of his death. In September 1832, the father sold his North Carolina farm and came to Indiana, locating in Wayne County. After one year’s residence there he came to Henry County and bought eighty acres of land in Greensboro Township, where he lived for a number of years. He then moved into the town of Greensboro and remained there until his death, in his eighty-fourth year. When the subject of this sketch was brought by his father to this county he was but fourteen years old and he remained at home until he was eighteen years old. He had but limited opportunity for obtaining an education, being early thrown upon his own resources. He worked on a farm in Wayne County one year, but then came back to this county. Then he returned to his former employer in Wayne County. He teamed in the northwest and relates that he has driven as far as twenty miles without seeing a house or a living person. During the first year at this work he received nine dollars per month, the second year, eighteen dollars, and the third year, twenty dollars per month. Out of the wages thus earned he saved two hundred and twenty-five dollars, which he placed at interest. About 1838 he purchased eighty acres of land in the woods of Henry County and courageously started in to create for himself a home. It required many days of hard. Unremitting toil to accomplish this, but such progress did he make that he was at length enabled to add to his original purchase two eighty-acre tracts. In 1862 he erected a house in Greensboro and retired from the active pursuit of agriculture, having by his indefatigable industry, wise judgment and economy accumulated an estate worth probably fifteen thousand dollars. The subject was united in marriage with Sarah, the daughter of Edward and Sarah Ann (Johnson) Beeson. She was born in Henry County, Indiana, and was educated in the common schools and at Spiceland Academy, after which she taught in the schools of Hancock, Wayne and Henry counties. To Mr. and Mrs. Hinshaw there were born the following children: Asael, deceased; Tersa is the wife of Rufus Walton; Martha, deceased, is the wife of Alfred Hosier; William H. is married to Sarah Luthultz. Mrs. Sarah Hinshaw died in 1882 and in 1883 the subject was again married, the lady of his choice being Miss Mattie Beeson. She was the daughter of Edward Beeson and was born in 1814 [sic]. In their religion their creed harmonizes with that of the Society of Friends, in which society they are active and consistent members. Fraternally the subject has been a member of the Independent Order of Odd Fellows since 1866. He has passed all the chairs of the local lodge, belongs to the encampment and has several times been a representative to the grand lodge. In politics he is an ardent Republican. He cast his first presidential ballot for Gen. William H. Harrison and in his younger days was very active in the campaign work of his party. He was elected and served as one of the three trustees of his township and has several times acted in the capacity of supervisor, as such superintending the construction of three school houses. Mr. Hinshaw has in all the relations of life proven himself equal to the responsibilities which have been thrown upon him and because of his many sterling qualities has won the regard of the entire community. His life career has been one of great activity and it presents much that is pleasing as well as profitable to young men just starting out upon the world’s great highway. Mr. Hinshaw possesses two valuable relics in the shape of parchment deeds, one dated April 3, 1829, and signed by President Andrew Jackson, and the other dated April 16, 1835. 1850 census, Greensboro Township, Henry County, Indiana; roll 151, page 294; dwelling #616. 1860 census, Greensboro P.O., Greensboro Township, Henry County, Indiana; roll M653-266, page 427, line #10, dwelling #1534, family #74. 1850 census, Greensboro Township, Henry County, Indiana; roll M432-151, page 294, line #24, dwelling #616, family #616. 1880 census, Greensboro, Henry County, Indiana; roll T9-284, ED 7, page 122B, line #16, dwelling #214, family #216. 1900 census, Greensboro, Greensboro Township, Henry County, Indiana; ED 60, page 1B, line #82, dwelling #25, family #30. 1840 census, Henry County, Indiana; USGenWeb Archives (page 110, line 22). Underground Railroad web site: http://www.ugrr.org. "Indiana True Democrat", October 30, 1851. 1850-1920, Indiana Works Progress Administration; Book CC-7, page 187.